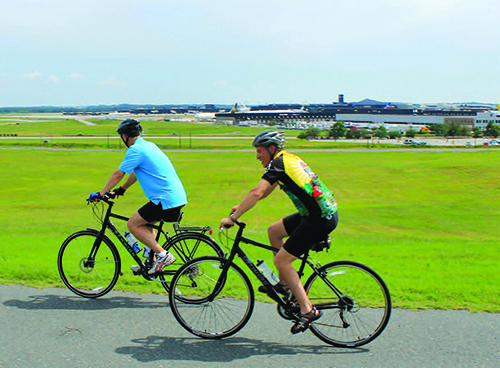 For more than 20 years, travelers, airport employees and the general public have enjoyed the 12.5-mile Hiker-Biker Trail that loops around the outside of Baltimore/Washington International Thurgood Marshall Airport (BWI). It even includes bike rentals for just $13 per day and passes through a park with a playground. In addition to its outdoor trail, BWI provides two indoor walking paths, an onsite gym and notably healthy food/beverage options. In fact, the Physicians Committee for Responsible Medicine named BWI the Healthiest U.S. Airport in 2014. Although the award focused on benefits for passengers, Smith notes that the various offerings also create a healthier, happier workplace for employees. Internal Achievement: 95% of food/beverage vendors offer healthy options such as protein smoothies, gluten-free pizza, turkey or vegan burgers, etc. “It’s not unusual to see four or five Southwest Airlines employees walking up and down the concourse in a brisk way, getting in a walk,” Smith reports. Building on the popularity of its walking paths, BWI added an in-airport workout facility last February. ROAM Fitness offers passengers a new way to maintain their fitness routine while traveling and provides a popular employee perk. The 1,175-square-foot gym at BWI is the company’s first location and has been a long time in the making. Ty Manegold, co-founder and president of ROAM, explains that the team formed four years ago with a vision to bring its new fitness option to airports around the world. With the gym at BWI up and running, the company hopes to have 20 U.S. locations within five years. Its next targets are San Francisco International, Denver International and John F. Kennedy International. Overseas, Dublin Airport is at the top of its list. Plans to develop international locations focus on targeting airports with U.S. Customs and Border Protection Pre-Clearance Checkpoints. ROAM designed its fee structure for wide appeal: one- to five-day passes for transient travelers and month-long or yearly memberships for frequent flyers and employees who are at the airport on a more regular basis. All users receive full access to the workout facility (cardio equipment, free weights, medicine and stability balls, yoga props, etc.) and a 15-minute shower with towel service. Annual members can reserve shower time 24 hours in advance. Bathrooms are outfitted with automated fixtures, flight information displays, Amazon Alexa dots and high-end toiletries such as Malin + Goetz bath products. Manegold explains that the team tried to think of any possible travel situation and prepare for it. Visitors can use complimentary Brooks running shoes and lululemon clothing; Wi-Fi provides easy access to their usual workout music or treadmill entertainment; and packaged health food and beverages provide pre-workout fuel and recovery nutrition. Visitors who bring their own workout clothes can even shrink-wrap them before leaving at no charge. Airport Sherpa, BWI’s internal delivery service, helps eliminate a common obstacle for passengers without enough time to eat and exercise. Now, they can do both: Work out for 30 minutes at ROAM, order a salad and protein shake online, jump into shower and meet the food delivery person at their gate. 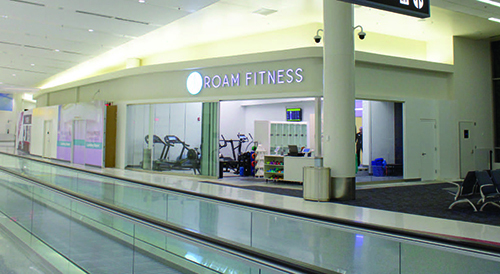 When launching its post-checkpoint gym concept, one of the first hurdles ROAM had to clear was convincing airports that a fitness center was worth the opportunity cost. In the end, airports began to see that a workout facility provides curb appeal and is a positive option for passengers and employees, says Manegold. It also leads to increased sales in other areas of the facility, he adds, noting that research shows happy travelers spend more money. Fully 60% to 70% of the customers at the gym at BWI are departing travelers, and many are repeat visitors who come to the airport early to work out before they take off. Arriving travelers are less common but not unheard of, and some are red-eye travelers who just want a shower or a more private place to stretch. Apparently, that idea is resonating. “We’re seeing more and more employees beginning to make use of that facility and fit the workout into their flying schedule,” reports Smith. Airport officials appreciate the balance that their concessions manager strikes between trendy health food items and traditional favorites that are often less nutritionally virtuous. Fraport (formerly Airmall) realizes that at the end of the day, its vendors need to make a profit by offering products that sell, Smith explains. Fraport’s street pricing allows both groups of customers to buy with confidence and not worry about overpaying because they’re at an airport, explains Kelly. Airmall was the first company to introduce the pricing model at U.S. airports, he adds. Smith is especially pleased with Fraport’s work to help the airport offer diverse food options for all passengers. “They make sure that we have at least one dedicated health food option on the concourse and the others have something on the menu,” he explains. On that note, the Maryland Aviation Administration is developing a more structured wellness program that will include health incentive programs for BWI employees. Meanwhile, Smith reports that the airport’s current exercise and healthy dining options have already made a noticeable impact engaging the employee base. Some of his office personnel use the ROAM Fitness center every morning. He compliments BWI for supporting its employees with healthy amenities that are more typical of large corporate campuses. After working on health initiatives with a variety of airports, Kelly suggests looking close to home when adding healthy food/beverage options. Starting locally has allowed Fraport to expand programs organically and provide concepts that are in tune with an airport’s specific mission and community, he explains. Smith agrees, noting that BWI is currently trying to achieve two very different goals: make the airport easy to get through quickly, while also making it a destination where visitors want to linger. “We want to be ahead of the game, and offer those experiences here,” he explains.